WASHINGTON — Should the U.S. Air Force cancel the JSTARS recap? One of Congress’ biggest defenders of the original JSTARS ground surveillance planes seems to think so. Republican Sen. David Perdue represents Georgia, home of Robins Air Force Base and where the service keeps the E-8C Joint Surveillance Target Attack Radar System planes. So he was skeptical when the Air Force announced this February its intention to cancel plans to buy new JSTARS planes and instead funnel that money into building a disaggregated network of platforms that would perform ground surveillance and battle management missions. But on June 12, Perdue told reporters he no longer feels like it’s a great idea to invest money in the JSTARS recapitalization program, citing Air Force concerns that a business jet-sized aircraft would not be survivable in a war against a near-peer adversary. “I do agree that wasting money on trying to recap this plane that’s not going to have access into denied airspace began to make no sense,” Perdue said at a Defense Writers Group breakfast. Instead of buying 17 new JSTARS planes — basically modified commercial jets outfitted with a large ground moving target indicator radar — the Air Force wants to invest in a new concept called the Advanced Battle Management System. Through ABMS, the service would finance upgrades to existing aircraft such as a new radar for MQ-9 Reaper drones or new communications gear for the E-3 early warning planes, as well as more money to network these assets together. Last week, the Air Force announced that Robins AFB would be the home for the ABMS commmand center — a decision that was applauded by Perdue as well as Sen. Johnny Isakson and Rep. Austin Scott, other members of the Georgia delegation. Congress has the ultimate say on what the military finances, and it could force the Air Force to go through with JSTARS recap procurement. So for now, the JSTARS recap remains in source selection, with Boeing, Northrop Grumman and Lockheed Martin still in contention for an engineering, manufacturing and design contract. The current inventory of E-8Cs was derived by modifying used Boeing 707s, so even though the planes became operational in the early 1990s, the airframes are gaining and in need of replacement. 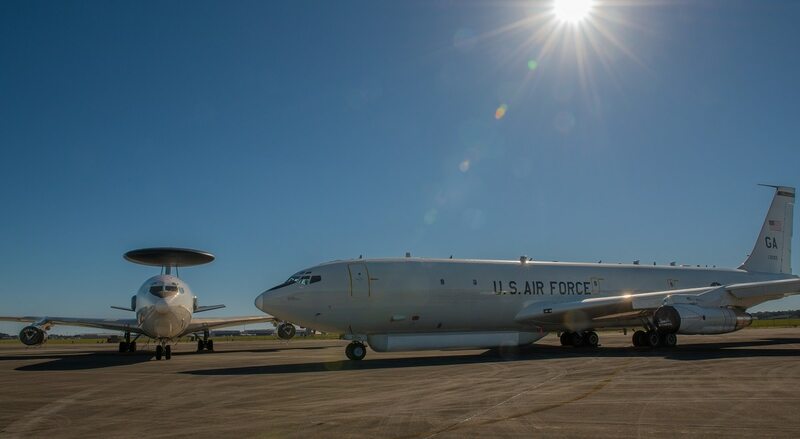 That has lawmakers, including Perdue, worried the Air Force might be unable to field ABMS in time for the E-8Cs’ retirement — which could be complete in the mid- to late 2020s. Lawmakers will seek “balance” between the Air Force’s multibillion-dollar program to replace its aging E-8C JSTARS and something new, a key congressman says. The Senate Armed Services Committee, on which Perdue sits, wants to allow the Air Force to cancel the JSTARS recap, followed by Congress authorizing more money to expedite ABMS. However, both House defense committees want to force the Air Force to carry on with the JSTARS recap, and include money and language that would require it to award an EMD contract.